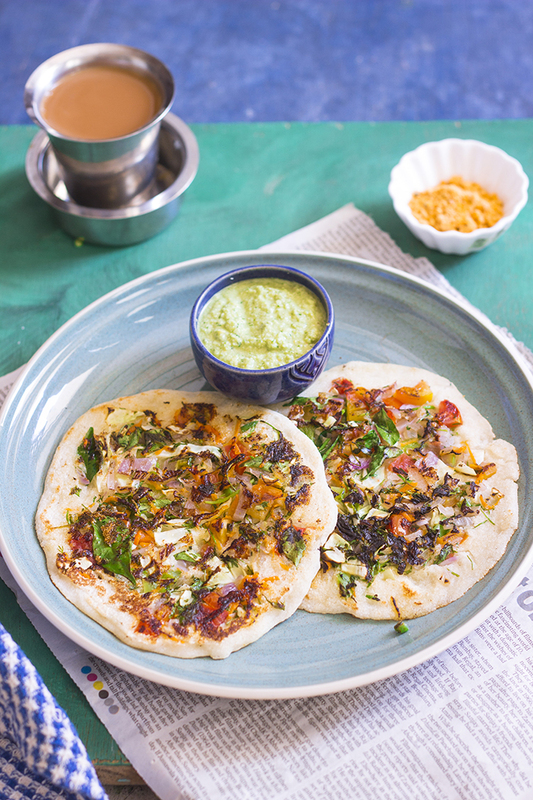 Instant Mix Vegetable Uttappa is a quick savory South Indian pancake that is made from semolina and topped with finely chopped vegetables. 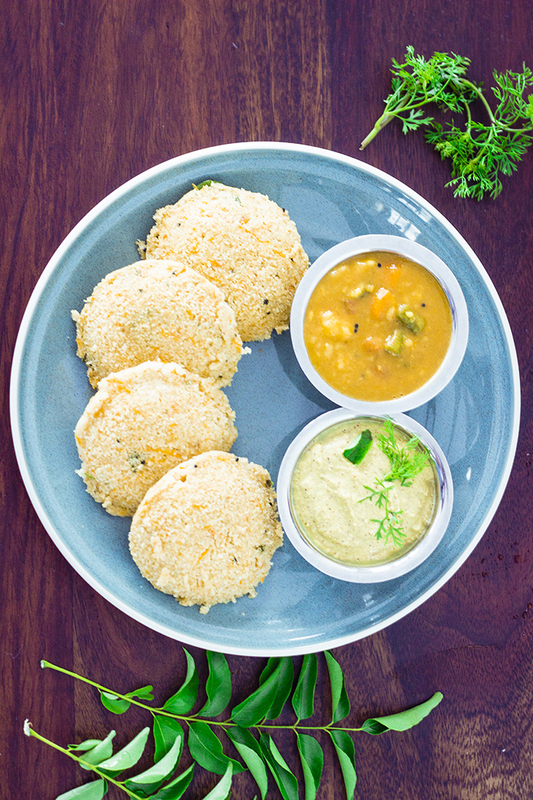 It is popularly served as breakfast along with some fresh coconut chutney. I'm a complete breakfast lover! These days breakfast is served with a side of "Man with a Plan" playing on Amazon Prime. The show on the side changes, but the love for breakfast never does. Right from childhood, I've always woken up hungry. It doesn't matter what time I wake up, it could even be a short afternoon nap, but I am hungry for the first 10 minutes after I wake up. It seems like I spend a lot of energy in sleeping and dreaming. But this also gives me the opportunity to actually enjoy my breakfast. I've heard of people forgetting to eat their breakfast (Gee!) and people not being hungry even an hour after waking up (Raj! ), but not me, I was born to enjoy the first meal of the day. Since this has always been my favorite meal, I keep searching for recipes and ideas to keep it interesting. And for me breakfast has to be instant, else it has to be made the previous night. I cannot wait for hours to prepare something. So instant recipes are always a hit with me, like this Instant Mix Veg Uttappa. 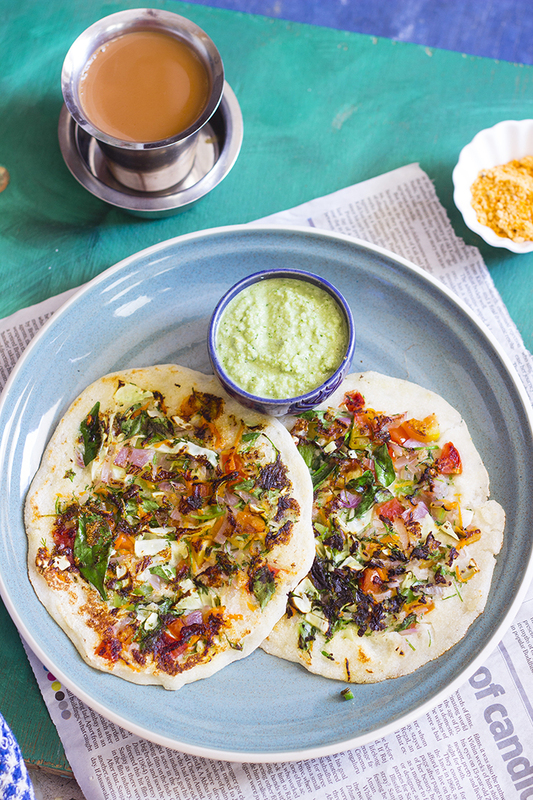 To tell you the truth, Uttappa is my favorite way to eat a dosa, even over a Masala Dosa. It's something about those charred onions on top that just makes me want it more than the others. I just went a little ahead with this Instant Uttappa, I topped it not just with onions but with a mixture of vegetables. You can keep it traditional and just use onions, or just use tomato. I love Tomato Uttappa too, with a little bit of spicy chutney pudi sprinkled on top of it. This Instant Mix Veg Uttappa requires just a few ingredients. Rava or Semolina or Sooji forms the base along with some sour plain curd (yogurt). A pinch of baking soda or cooking soda is added to give it that slight fluffiness. You can also use fruit salt like Eno, but add just a pinch. These ingredients along with salt and water just form the dosa, the actual base of the Uttappa. As I mentioned earlier, you can now top this with vegetables of your choice - traditional choices are onions or tomatoes, I used a variety - onions, tomatoes, cabbage, capsicum and carrot along with some green chillies, curry leaves and coriander. 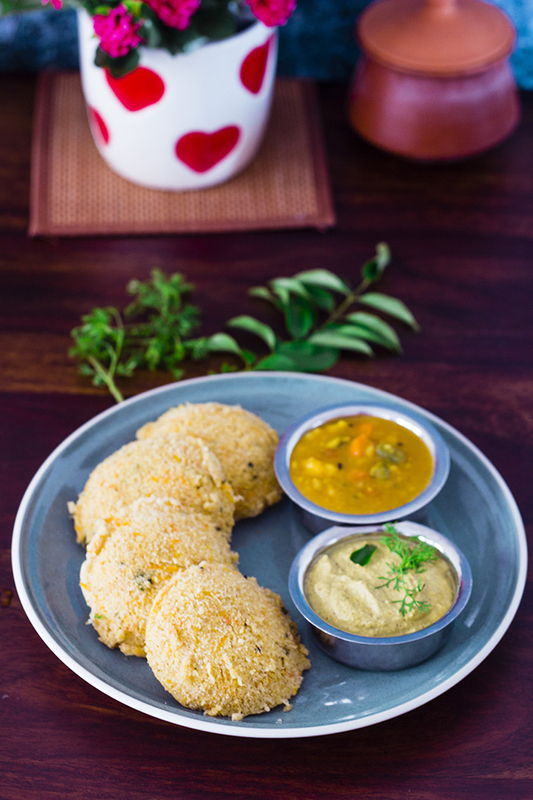 Instant Mix Veg Uttappa can be served for breakfast or as an early evening snack. You can also serve it for dinner (I'm a big "breakfast-for-dinner" person). 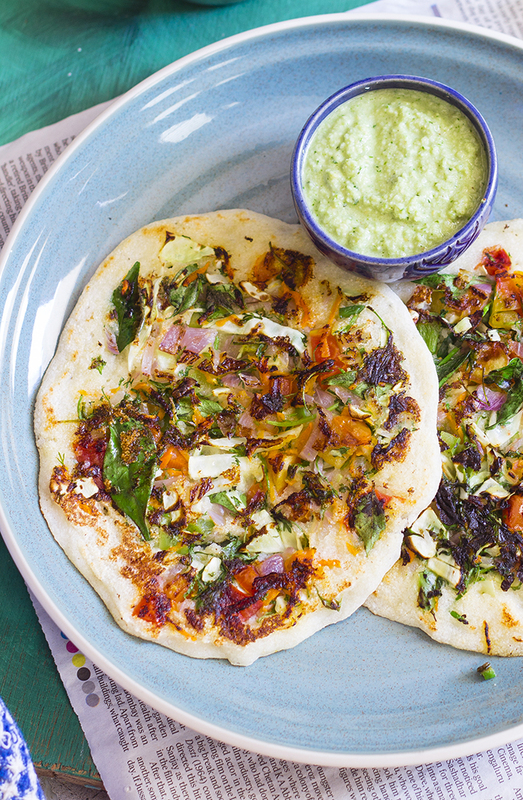 Serve the Uttappa with a fresh coconut chutney. 1. Mix together semolina, yogurt, 0.5 tsp salt and 0.25 cups of water until well combined and keep aside for 20 minutes. 2. After 20 minutes, add in the baking soda and mix. 3. Add a little water and mix until there are no lumps. Add more water as required, the batter has to be of the same consistency of a dosa or pancake batter. 4. If the batter is too thin, you can add in a little rice flour. 5. Mix together the onions, tomatoes, carrots, cabbage, capsicum, curry leaves, green chilli and coriander leaves in a separate bowl. 6. Add a little salt and mix well. 7. Grease a dosa tava or a flat frying pan. 8. Once the tava is hot, pour one spoonful of batter onto it. 9. Top it with the mix vegetables. Pour a teaspoon of oil on the top. 10. Allow the uttappa to cook for 1-2 minutes on one side or until slightly browned. Cook on low to medium heat. 11. Flip the uttappa and allow it to cook completely, approximately 2-3 minutes. 12. 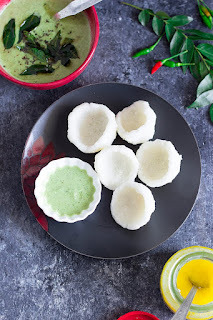 Remove from tava and serve hot along with some fresh coconut chutney. Broccoli Zucchini Fritters or Tikkis are cutlets made from finely chopped broccoli, grated zucchini, carrots and peas along with some cheese and spices. The fritters are shallow fried in this video. Broccoli Zucchini Fritters are a fun way to eat the healthy vegetables. This recipe is kid-friendly and the perfect dish to sneak in vegetables to your children. It's a Fabulous Friday and I'm back with a snack recipe. I realized you can never have enough of those. These fritters are so DELICIOUS, you won't even know they are made from such healthy ingredients. It has so many vegetables, it is almost a salad! 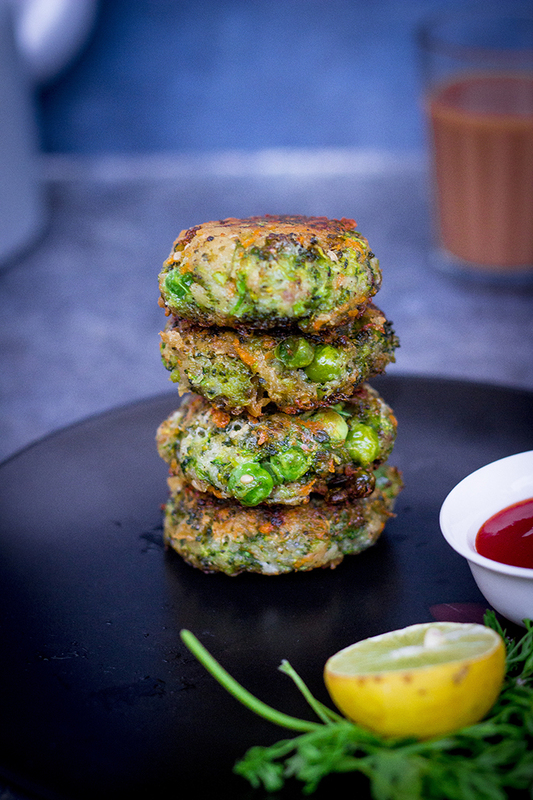 So these fritters are made with one of my favorite veggies - Broccoli. I've been in love with the vegetable since I first tasted it. The taste, the texture, the color, I cannot get enough of it and I find it hard to accept that there are folks out there hating this awesome vegetable. You have to try these Broccoli and Zucchini Fritters if you are a Broccoli lover like me, and you have to especially try it if you hate Broccoli. This recipe will CONVERT you! Trust me when I say, you won't even realize that you ate it with all the delicious medley of flavors in there. So these cutlets or fritters are not just about the Broccoli, as I mentioned, it is practically a salad, just shaped beautifully and shallow fried, but a salad nevertheless. It has the added goodness of carrots, now all of us love carrots, right? Now tell me you definitely love Zucchini. I totally do. Carrots, eh, not so much, but Zucchini, I can do so much with. Zucchinis are so versatile, use them in Zoodles, use them as a Lasagna sheet, or you can use them in a frittata like I did. Then I just added in some frozen green peas, because I just wasn't satisfied with all the other healthy ingredients... ok, jokes apart, the peas add a slight sweetness and texture that I really really like. 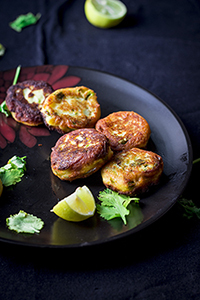 To make these fritters, the veggies are microwaved before mixing in the other ingredients. This helps in reducing the batter getting moist at a later time. You can also lightly saute the veggies or just steam them slightly before using. Soaked and crumbled bread is added to help bind the veggies together. You can use bread crumbs instead. I used Pizza Cheese, which is a mix of mozzarella and cheddar cheese. Use any cheese you have. I recommend something that melts easily. Deep fry or bake if you desire, I found shallow frying gives it the texture I desired without using too much of oil. 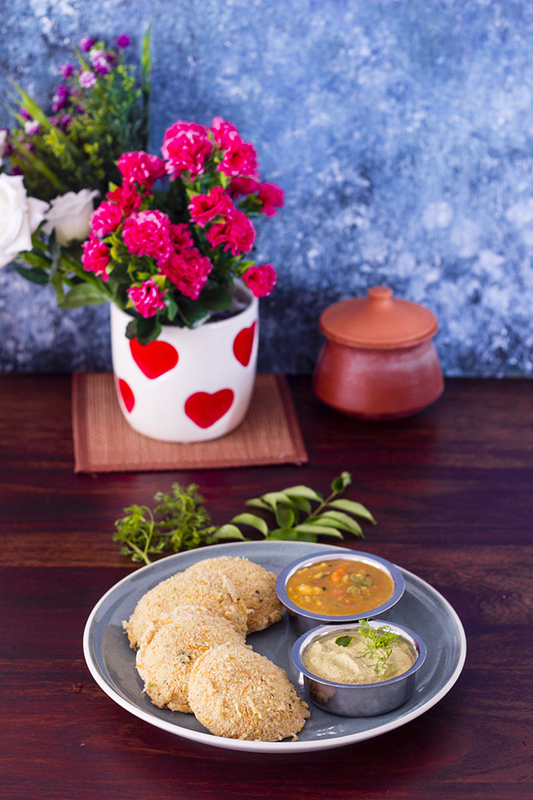 These cutlets are kid friendly and a perfect way to sneak in vegetables to your children. These Broccoli and Zucchini Fritters are a perfect appetizer to serve for dinners or as a fancy tea time snack. 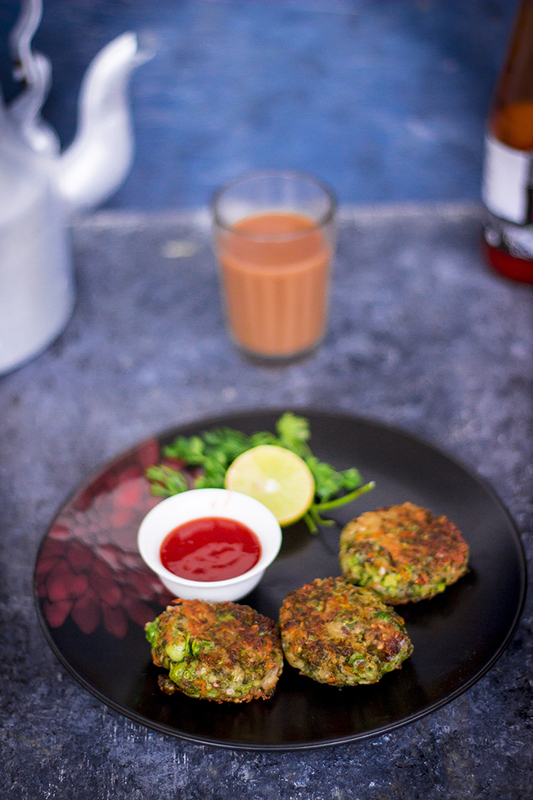 Broccoli and Zucchini Fritters are shallow fried vegetarian cutlets made from broccoli, zucchini, carrots and green peas. 1. Add chopped broccoli and green peas to a microwave safe bowl and microwave on high for 2 minutes. 2. Squeeze out the water from the zucchini and add to the bowl along with grated carrot. 3. Microwave on high for another 2 minutes. 4. Add grated cheese, cornflour, salt and pepper to the bowl and mix well. 5. Soak the bread in water and squeeze out the water. Crumble the bread and add to the bowl. Mix well. 6. Divide the batter and shape into patties. 7. Heat oil in a pan and shallow fry the patties in it. 8. Flip when the first side browns. 9. Remove from oil once both sides browns. 10. Serve hot with ketchup. Simple delicious masala bread toast made by topping bread with fried onions, carrots and spices in Bangalore Iyengar Bakery style! You asked for snacks, so here goes - Masala Bread Toast made in full Banglore's Iyengar Bakery style!! So I recently posted a poll on my Facebook Page. Have you liked it yet? Go on, like it so you never miss out on what's cooking on One Teaspoon Of Life!! Anyway, so while not many of you voted, the choice was waaay too clear. All you ever want to eat is snacks. There is no satisfying you folks out there, is there? But you are my kinda people. I would have voted snacks too! To say I love snacks would be an understatement. I am forever hungry for snacks, just like you. Today I'm sharing an extremely simple recipe. 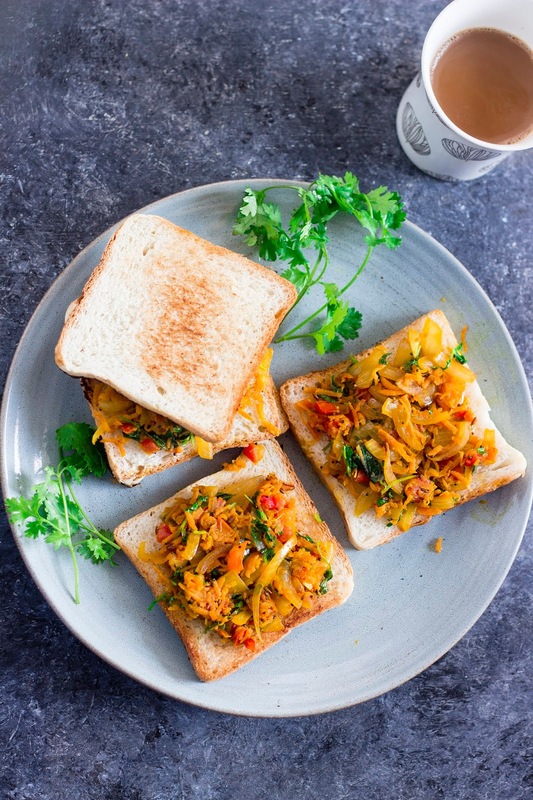 This Masala Bread Toast is an extremely popular product in Banglore's famous Iyengar Bakeries. And something I buy regularly. Every evening as I travel home from work, I have just one thought on my mind - "What do I eat for evening snacks today?". Sometimes, it is just leftover breakfast (I always make extra), or a dosa or pakoras, but a lot of times, it is this Masala Bread Toast from the bakery right behind my apartment complex. So when you guys asked for snack, I thought this recipe was perfect. It is quick, it is filling, it is healthy if you use the right bread, and it is vegan too. But above all, it is delicious and your family will love it. 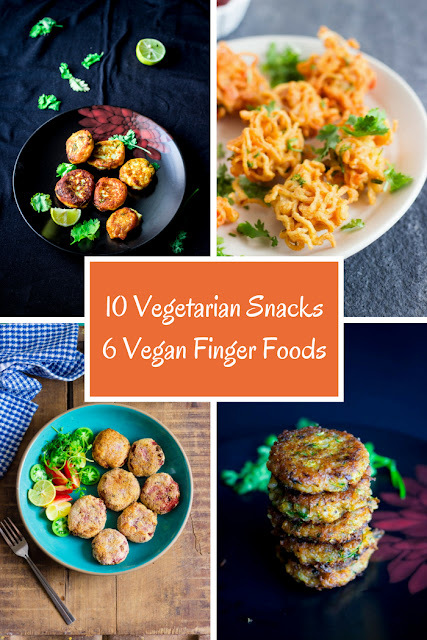 It is also an excellent way to add veggies to your snacks. Although I have used some spice mixes like garam masala and chaat masala, you can skip them if making for kids or if you don't have access to them. The masala tasted perfectly tasty without any spices too. 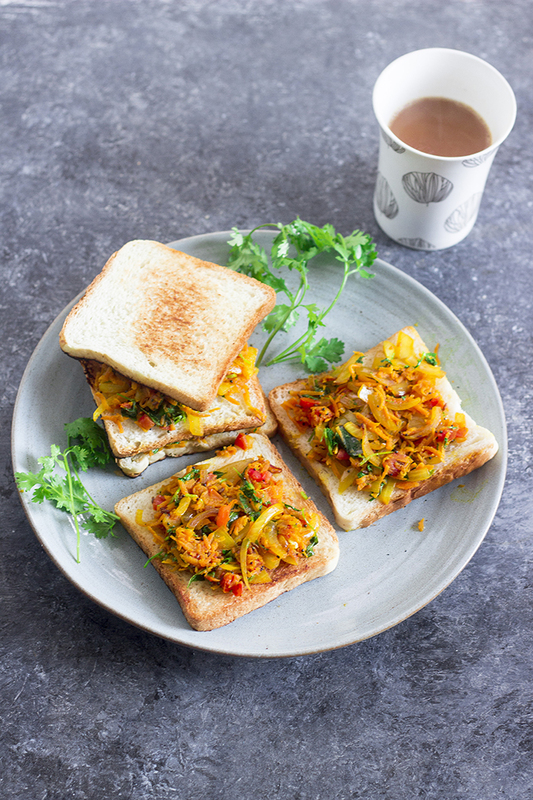 Simple delicious masala bread toast made by topping bread with fried onions, carrots and spices in Bangalore Iyengar Bakery style. 2. Once the mustard splutters, add in the cumin seeds. 3. Once the cumin browns slightly, add the curry leaves and allow them to crisp up. 4. Now add the onions and saute them until they are lightly browned. 5. Toss in the grated carrot and mix well. 6. Add the diced tomatoes and mix. 7. Add the salt, chaat masala, garam masala and sugar. Mix well. Adjust the seasoning to suit your taste. 8. Cook for 2-3 minutes and remove from heat. 9. Add the chopped coriander leaves and mix well. 10. Dry toast the bread. You can add butter or oil while toasting if you like. 11. 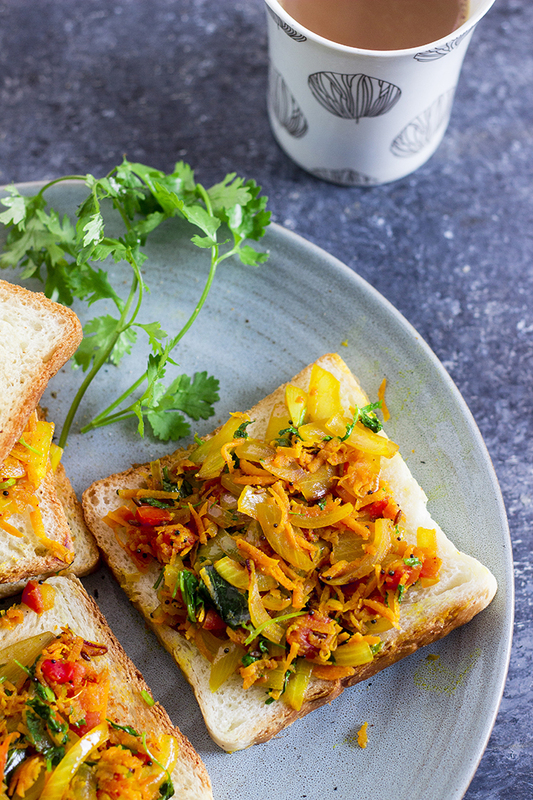 Spread the masala on the toast and serve it immediately like an open sandwich. 12. You can make the masala before and store it in the fridge, just heat it up before serving and top on the freshly toasted bread. Fragrant, creamy and vibrant vegan Thai Green Curry made with fresh ingredients!! Happy 2018 guys!!! I know I’ve been AWOL for way too long from the blog and I feel extremely guilty. It may be a new year but my excuses are the same – work, home and travelling took up so much time that I could not devote enough to my one passion – my blog. I’ve missed blogging much more than anything last year and I don’t wish to repeat that again. So hopefully, you’ll see more of me and more consistently in 2018. Cheers!! If you’re following me on Instagram, then you know what I’ve been eating and where. No? What are you waiting for, go follow me here or search for @oneteaspoonoflife on Instagram. Just to catch you up a little, I spent the last week in Chicago freezing myself. I went from a comfortable 20 degrees C (Positive) and to -20 degrees C (negative) for one week. My fingers froze when they weren’t in the coat pockets and my ear hurt when it errantly slipped out of the cap. I applaud those who brave this weather regularly, but I’m not made for that chill. While it was an a nice to experience just how that cold feels, I’m happy to be back to warm weather where I don’t need even a light jacket and I can roam around in open sandals. I am one of those weirdos who actually likes airline food. I look forward to meals on planes. But after 8 meals in a span of one week plus a week of eating in restaurants, I’m just simply glad to be back to eat warm clean food at home. 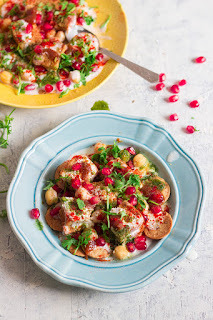 A touch of spice, a lot less cheese and a lot of health – that’s how I like my everyday food. So my first recipe of 2018, is this warm flavorful Thai Green Curry with lots of vegetables that is perfect for cold winters. Did I tell you how much I love it? It is simply delicious plus it is hearty, healthy, vegan, gluten-free and full of fiber. Serve it with a bowl of brown rice for a healthier meal. I also had so much fun making this curry. I found all the fresh ingredients in the market and they were such a colorful bunch. I enjoyed shooting this recipe, all those colors popped beautifully. Back to the recipe, one might be discouraged by the number of ingredients, but I ask you to look beyond it. The number may be more, but the effort is really not too much. The prep here is more time consuming than the actual cooking. And this is the perfect recipe to engage your family – ask your partner or kids to help out in peeling, chopping and slicing. Make it a family recipe and you won’t be so daunted. Honey Cake - Bangalore Iyengar Bakery style honey and orange cake. Video Recipe. Banana Bread - Delicious dense banana bread/cake. No-Bake Strawberry Cheesecake - Strawberry cheesecake made without egg or gelatin. Easy to make vegan Thai green curry that is made with a fresh green curry paste and creamy coconut milk along with lots of stir fried vegetables. 1. Powder the coriander seeds, cumin seeds and peppercorns coarsely. I hand pounded these in a mortar with a pestle. 2. Remove the outer later of the lemongrass stalk and chop into slices. 3. Roughly chop the green chillies, onions, green onions and garlic. 4. Add the pounded spices, lemongrass, green chillies, onions, green onions, garlic, chopped ginger, chopped turmeric, coriander leaves, basil leaves, lime zest, lime juice, sugar/jaggery and 1 tsp of salt to the food processor or a mixer and give it a whizz. 5. Scrape the sides of the jar and grind again. Add water by the spoonful to get a smooth paste. 6. Adjust salt, sugar and lime as per your taste. 7. Fill in sterilized glass jars and store in the refrigerator for up to 2 weeks. 8. This recipe makes approximately 1.5 cups of curry paste. 1. Heat oil in a wok or kadhai. 2. Drain the excess water from the tofu using a kitchen towel. Add the tofu to the wok and fry until golden. 3. Remove the tofu and keep aside. 4. Add the carrots, mushroom, zucchini, broccoli, bokchoy stems and capsicum and stir fry them for 3-4 minutes. 5. Add the bokchoy leaves or spinach and stir until they are wilted. 6. Cook until the vegetables are cooked to your liking and remove it from the wok and keep aside. Preferably, the vegetables should be crunchy and not overcooked and mushy. 7. Heat the remaining oil and add the green curry paste. Stir fry it for 1-2 minutes until fragrant. 8. Add the stir fried vegetables along with the boiled sweet potato to the wok. 9. Add the thin coconut milk and cook it for 3-4 minutes. 10. Add the thick coconut milk and salt and cook for another 3-4 minutes. 11. Add the tofu before serving. Serve the curry hot with steamed white rice. 5 years of love, 5 years of disagreements. 5 years of understanding, 5 years of why-can’t-you-understand-me moments. 5 years in happiness and sadness. 5 years of ups and downs. 5 years of sharing work, 5 years of fighting over the TV remote. 5 years of buying new stuff, 5 years of we-really-need-to-get-rid-of-stuff. 5 years since we tied the knot. Sunday, the 16th was our 5th Wedding Anniversary. Somehow, being as different as chalk and cheese we’ve made it work. 10 years ago, I saw him across the room and wanted to get to know him. I did get to know him a few months later. We became friends, very good friends. Friends who fell in love eventually. Raj is probably the nicest guy around. A man who hurts not even a mosquito (literally!! ), much to my annoyance. A man with immense patience - he can entertain toddlers for hours and teach technology to senior citizens. But totally loses it when someone cuts in front of his car breaking traffic rules. A man who sings well but has two left feet when it comes to dancing (he may as well be fighting Kung Fu with me). Totally low maintenance guy, whom I love very much, no matter how much he annoys me at times. Travel – We both love to travel, we’ve always loved to see new places and take long drives. We loved the snowcapped peaks of Manali just as much as the pristine waters of Phuket. We were equally mesmerized by the Taj Mahal as we were by the Sigiriya Rock in Sri Lanka. Desserts – Both of us have a massive sweet tooth and are always trying to curb it. But yes, desserts are our weakness, no matter how much we try. Movies – We may have different tastes in movies, I love rom coms and he love his action movies (typical Man.. Duh! ), but give us an Animated Movie and we are willing to tolerate the headache we both get from the 3D glasses. Jamie Oliver and Top Gear – He’s all about cars and I’m all food, but for a change we both love watching Jamie Oliver cook things we would probably never eat and watch them test drive cars on Top Gear that we will never buy. Tea – Tea is what led to this marriage according to me. We bonded over cups and cups of tea and still cannot get enough of. This Gajar ka Halway is a dedication to our 5 years of Marriage. 5 years ago, just before we got married, Raj told me he makes the most amazing Gajar ka Halwa and will one day make it for me. I’m still waiting for him to make it… I probably will be waiting for the next 5. So instead of denying myself of the sinful pleasure, I made it myself. Gajar ka Halwa or Carrot Halwa is a traditional North Indian carrot pudding that is made by slow cooking grated carrots along with milk, sugar, ghee and dry fruits. It is a sweet rich dessert, fit for special occasions, like our Wedding Anniversary. You can either grate the carrots or use a food processor to shred them. Use juicy carrots, avoid fibrous ones. The grated carrots are first lightly roasted in ghee. Then they are slow cooked in milk on low heat. Traditional recipe uses full fat milk. I used regular toned milk. Once the milk has almost evaporated, add the sugar. The sugar will melt and you will again find liquid in your halwa. I love some desserts very sweet. Adding the 1 cup of sugar will make the halwa very sweet. I suggest adding half a cup and letting it evaporate, before adding more if you prefer your desserts to be less sweet. Once all the sugar has evaporated, add the cardamom powder. I also love adding a lot of dry fruits to my desserts. I added almonds, cashew nuts and raisins after lightly frying them in ghee. Although I love cold Gajar ka Halwa, it tastes best when served warm. It also is great when paired with a scoop of Vanilla Ice Cream. Chana Dal Payasam | Kadle Bele Payasa - Kheer made with lentils, coconut milk and jaggery. Kaju Katli | Cashew Barfi- Fudge made from cashew nuts. Very popular Indian sweet. Kashi Halwa - Halwa made from ash gourd or petha. P.S - You know my biggest accomplishment? After 5 years, I finally got him to smile when the camera is pointed at him. Gajar ka Halwa or Carrot Halwa is a slow cooked North Indian carrot pudding made with grated carrots, milk, sugar, ghee and dry fruits. Heat 2 Tbsp ghee in a kadhai and add the grated carrot. On low heat, fry the carrots for 4-5 mins, stirring continuously. Add the milk and continue to simmer on low heat until all the milk has evaporated. Stir occasionally. This will take around 30-45 minutes. By the time the milk has evaporated, the carrots would have almost cooked. Now add the sugar and continue to cook on low heat. The sugar will melt and the halwa will again have liquid in it. Continue to stir occasionally. Once all the liquid has evaporated, add the cardamom powder and mix well. Heat the remaining ghee in a small pan. Add sliced almonds, split cashew nuts and raisins and saute until the nuts brown slightly. Add the nuts to the Gajar ka Halwa and mix well.